The Alnwick Muster Roll1 is one of the most important contemporary documents in the North East of England linked to the Battle of Flodden. 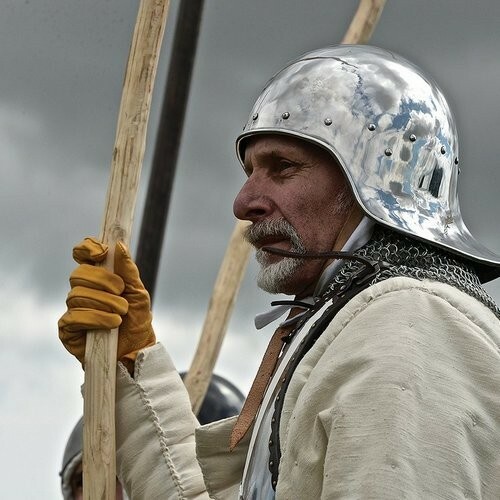 It is highly likely that the bowmen named on the Alnwick Muster Roll are the very men who were present not six months earlier with Sir William Percy on the field of battle at Flodden, and who survived to fight again. The Battle of Flodden occurred on the 9th September 1513, at which time Henry Percy, ‘The Magnificent’, was the 5th Earl of Northumberland. Henry VIII was still fresh on the English throne and had determined to spend his late father’s bulging coffers on re-establishing the English claim to France. For the past decade, there had been an unaccustomed period of peace between England and Scotland, following the marriage of Margaret Tudor, Henry VIII’s elder sister, to King James IV of Scotland. Henry’s invasion of France, however, provoked Scotland into action on the borders again, in support of her ‘Auld Ally’. The siege of Terouenne led to the ‘Battle of the Spurs’ (so called because the French were so eager to flee the battle field, that they were liberal in their use of the spurs). A large relieving force of the flower of the French chivalry was completely routed. This time, the 5th Earl of Northumberland is described by De Fonblanque4 as ‘commanding the Skowrers and Forriders – Northumberland Men on light geldings’, who took a prominent part in the pursuit, which ended in the dispersal of the relieving army and the capture of a large number of prisoners, many of high rank. There is an obvious discrepancy here between the earlier account of the Earl’s retinue made up of Yorkshire men alone, and this reference to ‘Northumberland Men’, though De Fonblanque gives no source for this quotation. The Alnwick Muster Roll. Alnwick Castle, Sy: W.I.9A manuscript in the College of Arms5 describes in great detail the Earl’s clothing for this foray, occupying seven closely written pages enumerating such items as doublets, riding coats of velvet and satin, embroidered in gold and silver, 25 pairs of boots, shoes and slippers, and 14 hats of different colours! His epithet, ‘The Magnificent’, was not undeserved. The list also describes items of uniform for the Earl’s retinue, such as 60 ostrich feathers for use of the captains and gentlemen. Hall’s Chronicle mentions the Earl’s retinue as follows: ‘The lordes and gentilmen so well armed and so richly apparreled in clothes of gold, and of silver, and velvetts of sundry colours pounsed and embrodered, and all petie captains in satin and damaske of white and green, and yomen in cloth of the same colours.’6 This was as much a display of fashion and wealth as it was a military expedition. Representing the 5th Earl of Northumberland at the Battle of Flodden was his younger brother, Sir William Percy, who fought in the left wing of the English army under the charge of his father-in-law, the 70-year-old Sir Marmaduke Constable of Flamburgh. With Sir William was a large number of the retainers of his brother, the Earl,9 most likely the Northumberland tenantry, including the archers from the Alnwick Muster Roll. The Earl himself was not present, but instead his Commisioners undertook the muster, which comprises only the bowmen from amongst the tenantry. In total, the muster roll lists the names of 71 bowmen. To offer some context, in the 1530s, the Percy Estates in Northumberland could raise 1967 men under the Constable of Alnwick, and the 5th Earl’s retinue from Yorkshire mustered at Newcastle in 1523, totalling 762 men.10 This 1514 muster roll records just the archers from parts of the two baronies of Alnwick and Warkworth (and does not include other of the Earl’s baronies and Lordships in Northumberland, such as Prudhoe and Corbridge). These archers seem to bear out the description given by Robert White in his 1859 account: ‘Many of the Archers wore the brigantine or jack...with his bow cased in coarse cloth and a sheaf of arrows. Beside the dagger and sword, on the hilt of which was usually a small buckler, he often had a leaden mell which he bore at his back, and so as the bow was useless in close combat, such a hammer was often as fatal as the great bill.’ He also noted that ‘White was the prevailing hue of the whole army’.11 This makes an interesting contrast with the rich colours and fabrics of the 5th Earl’s men over in France. Sallet Helmet(Photograph by Colin MacConnachie)The next frequently occurring item of equipment is the ‘sallet’, or as the Longhoughton men call it, ‘stel bonet’. George MacDonald Fraser describes this eponymous helmet as follows: ‘On his head the rider wore the steel bonnet, which in the early part of the 16th century was usually the salade hat, basically a metal bowl with or without a peak...These head pieces, many of which would be home-made by local smiths, were gradually replaced in Elizabethan times by the morion, with its curved brim, comb and occasional ear-pieces.’15 Robert Clephan describes sallads or sallets in the following terms: ‘visored sallads, with a peak behind and slits for vision appear in the reign of Henry VI. This sort of helm is in several varieties, and a simple form was in use among the rank and file, especially by archers.’16 The name ‘sallad’ is thought to come from French ‘salade’, via Spanish ‘celada’ from the Italian ‘celata’, believed to represent the Latin ‘caelata galea’ – ‘a helmet ornamented with engraving’,17 though the English rank and file version of the sallet would not tend to have any ornamentation. This covers the equipment mentioned in the muster roll, but what of the identities of the bowmen, many of whose surnames are still recognisable in the locality today? What sort of tenant would be making up the ‘rank and file’ archers of the Earl’s retinue? These bowmen tenants on the roll would be well practised archers, with the means to supply their own armour and equipment and sometimes their own horse or nag as well. These are not peasants. ‘The Red Book of Alnwick’ Alnwick Castle, Sy: A.I.2There is a further wonderful survival in the Duke of Northumberland’s Archives: ‘The Red Book of Alnwick’23 (so-called because of its red leather binding). The 6th Earl of Northumberland died in 1537, heavily in debt, and forfeited his estates to the Crown. In 1540/41, Crown Commissioners came to value the estate and composed this rental, which compares the rental from 1474 (also in the archives) with the rents being paid for the same land in 1540-1541. It is interesting to note that the rents payable had not increased at all in nearly 70 years. John Anderson is the last man listed in the muster roll list of Alnwick men, with his bow and jack. There is no way of knowing whether this is the same John Anderson, who is listed as a burgage-holder in 1541, nearly thirty years later. Burgage holders were certainly not the lowest rung of society, owning sizeable plots of land within town centres. It is interesting to note in passing the fourth entry on the page, where there is no 1541 value noted because in the intervening years: ‘Super hoc burgagium murum ville edificatus est’ – the town wall had been built upon this burgage plot. In the Red Book, there are also mentions of a Robert Storey,24 William Atkynson25 and Henry Ferrer,26 all of whom are listed as burgage holders (in some cases owning more than one burgage plot). All three names match names within the Muster Roll’s list of Alnwick bowmen in 1514. Noblets also occur throughout the Red Book of Alnwick in both the 1474 and 1540 rentals, but none has the Christian name ‘Henry’.27 It is not possible to conclude firmly that the bowmen in 1514 were burgage holders of Alnwick, but it is tempting to link them to their namesakes in the rentals, who would at the least have been related to them. There are still questions to be answered for which the evidence may not survive. Were these 71 bowmen the same men who had fought at Flodden under the command of Sir William Percy, or were they in fact the Northumberland men on light geldings, the ‘Skowrers and Forriders’, with the 5th Earl at Terouenne? What was the reason for the muster to be called in February 1514? Was this a roll call to examine who had survived Flodden, or was there the threat of further fighting in the aftermath of the battle? We may never know the answers, but this muster roll gives us a rare glimpse into the way of life in northern England in the early 16th century. The article notes the ‘Mussel Sale’. This was the grand sale in 1765 of the antiquities accumulated by Ebenezer Mussel, an eighteenth century Justice active in the Hackney Petty Sessions, who died in 1764. Little is known of Ebenezer Mussel beyond the fact that he was a great collector of peculiar antiquarian pieces, including buildings and archaeological finds. The third item listed, however, is the ‘sword of James IV of Scotland, taken at Floddenfield’. If the fancy had taken the First Duchess in 1765, this sword might have taken pride of place in a Flodden exhibition at Alnwick Castle marking the 500th anniversary of the battle. The Archives of the Duke of Northumberland at Alnwick Castle (henceforth: ‘Alnwick Castle’), Sy:W.I.9. I acknowledge with thanks the help of Linda Bankier, Berwick Archivist, who first spotted the muster roll in the catalogue and provided digital images and a transcription of it. Edward Barrington De Fonblanque, Annals of the House of Percy, Volume I, (London, 1887) p. 335ff. A.G. Bradley, ‘The Romance of Northumberland’ (4th edn, 1923), p375ff. Robert White, ‘The Battle of Flodden’, From Archaeologia Aeliana, Vol iii (new series), 1859, reprinted in book form, p9. Oxford Dictionary of National Biography, Edited by H.C.G. Matthew and Brian Harrison (Oxford University Press, 2004), Volume 43, p716. (Entry for 5th Earl of Northumberland). Robert White, ‘The Battle of Flodden’, From Archaeologia Aeliana, Vol iii (new series), 1859, reprinted in book form, p12. George MacDonald Fraser, ‘The Steel Bonnets, The Story of the Anglo-Scottish Border Reivers’, (Harper Collins, 1995), p86. George MacDonald Fraser, ‘The Steel Bonnets, The Story of the Anglo-Scottis Border Reivers’, (Harper Collins, 1995), p86. The Compact Edition of the Oxford English Dictionary, Complete Text Reproduced Micrographically (Oxford University Press, 1979). Matthew Strickland and Robert Hardy, ‘The Great Warbow: from Hastings to the Mary Rose’, (Stroud, 2005), p199. Steven Gunn, ‘Archery Practice in Tudor England’ from ‘Past and Present’, (The Past and Present Society, Oxford, Nov 2010), p1. The Account roll for 1508-9 (Alnwick Castle, Sy: C.III.4b) was also searched without finding any matching names. The items are listed in the the First Duchess’ catalogue of ‘Antiquities, Historical Curiosity’s, Miscellaneous Ditto, Manuscripts, Japan Porcelain Glass etc.’ This is a volume in the Duchess’ own hand, compiled c1770. (Alnwick Castle, DNP: MS 125). The items are recorded under ‘Historical Curiosity’s’ [sic], and the provenance is recorded as ‘Mussel sale’.